I met Julie Cole at a blog meeting a few years ago…she was outgoing and welcoming. Since I felt like a “fish out of water” as I was new to blogging and was about 20 years older than the average blogger at the meeting, her smile and friendly hello put me at ease. I learned about her company Mabel’s Labels and it changed my life as far as labeling goes…you see, I am grandmother and I do a fair amount of the labeling of clothes. In addition, my granddaughter has food allergies so lunch labels were a great idea even though her school is nut free. Shoes and especially boots were particularly problematic as many children had the same ones. Mabel’s Labels eliminated all of our lost clothes worries. If they were misplaced the Mabel’s Labels has made it easy to find in the Lost and Found! Over the past three years, I have followed Julie Cole on Facebook and have become a Mabel’s Labels Affiliate. 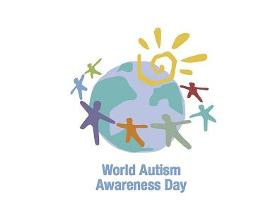 Today is Autism Awareness Day, and Julie is writing about it on her blog. She is personally familiar with this syndrome as her son has been diagnosed with it. autism at the age of three. I hope you enjoy Julie as much as I do. This entry was posted in Family, Kids and tagged Autism, Autism Awareness Day, autism support, Mabel's Labels by llpitlwp. Bookmark the permalink.